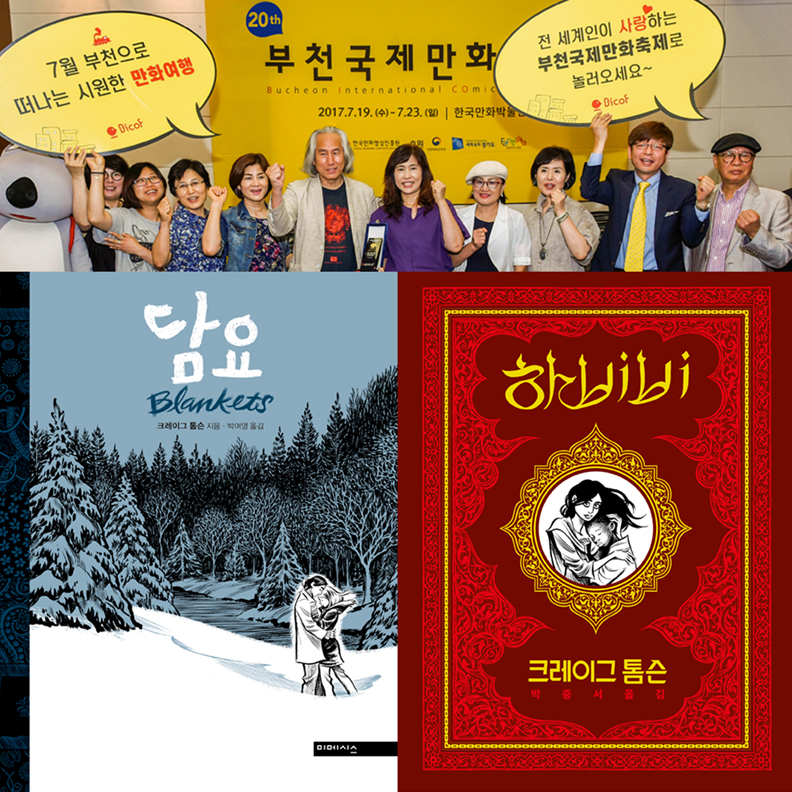 After laying dormant for far too long, I’m touring again – this time to South Korea for the Bucheon International Comics Festival (their twentieth year!) 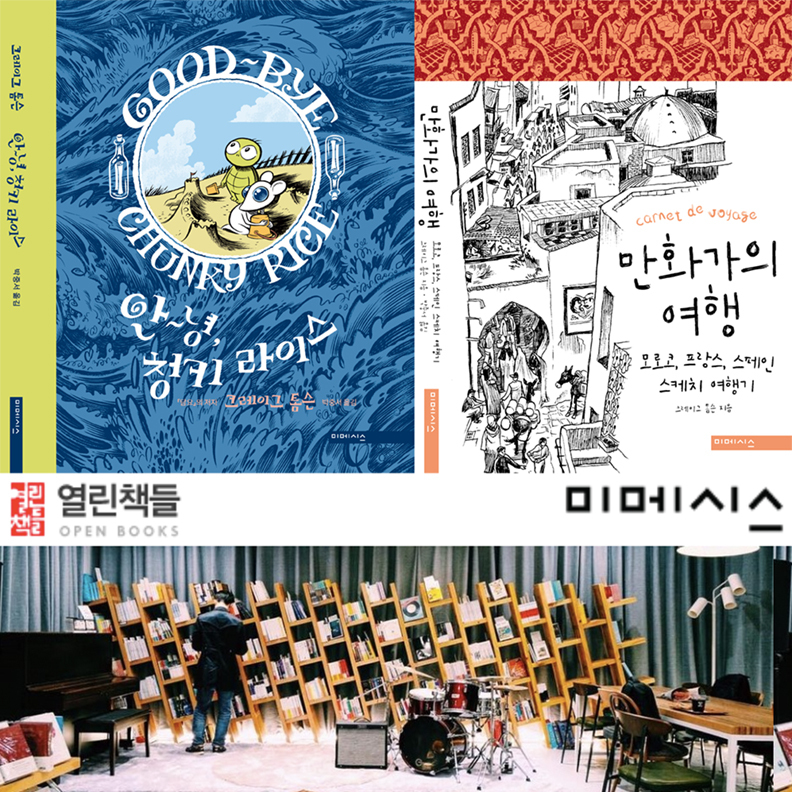 July 19th-23rd, 2017, and a store event at Book By Book in Seoul on July 22nd, and plenty of promotion for the Open Books/Mimesis editions of my books. Hope to see some of you there! 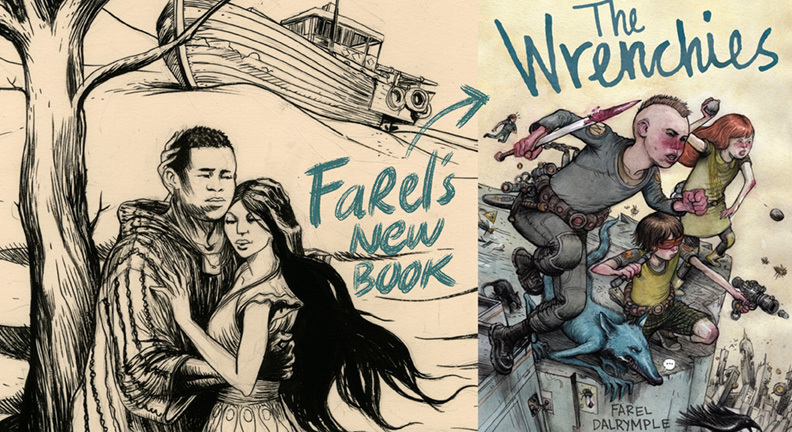 My drawing buddy Farel Dalrymple has a new graphic novel out from First Second titled WRENCHIES. On the surface, it appears a post-apocalyptic adventure, but underneath it’s a meta, existentialist, psychedelic, and deeply personal epic. WRENCHIES explores religious upbringing, guilt, addiction, and self-destructive tendencies while leavening it with moments of child-like, nerdy bliss and the most endearing chubby kid in a homemade superhero outfit named Hollis. Haunting and glowing. If you’re in Portland, FLOATING WORLD is hosting a launch for the book from 6-10pm this Thursday, August 7th. 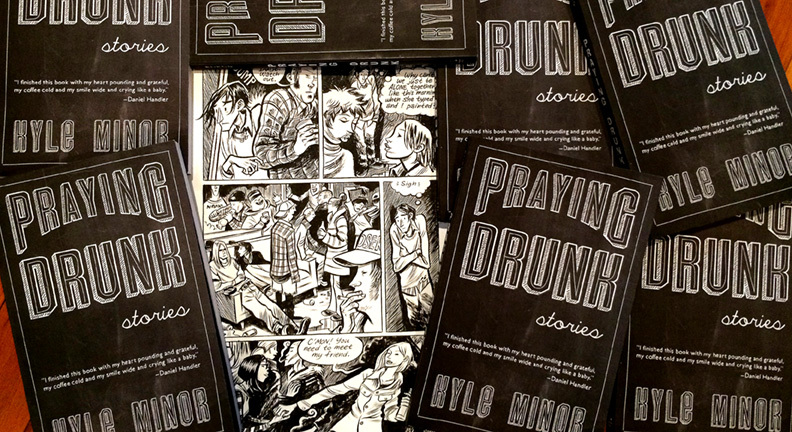 Another book I NEED to endorse is Kyle Minor’s PRAYING DRUNK. My fervor for this book is almost religious; I went and ordered a bunch of copies directly from the publisher SARABANDE BOOKS to proselytize my loved ones. And yet I’m dumbfounded attempting to articulate the magic this book works — the blurbs on Minor’s site do a decent job – or you can wet your curiosity with a great interview with the author on my pal David Naimon’s literary podcast BETWEEN THE COVERS. What I can say is this book shook me and humbled me and stays with me, and you won’t regret picking up a copy for yourself. This morning’s clutter on the drafting table – inking several SPACE DUMPLINS pages simultaneously. Also my friend Kazim Ali is in town for a reading from his new book SKY WARD at Reed College TONIGHT (6:30 Elliot Hall Chapel) for those of you in Portland. Here he’s writing Arabic on my new Cintiq (more on that in some future post… As evidenced above, I’m still inking with actual India ink & brush.). 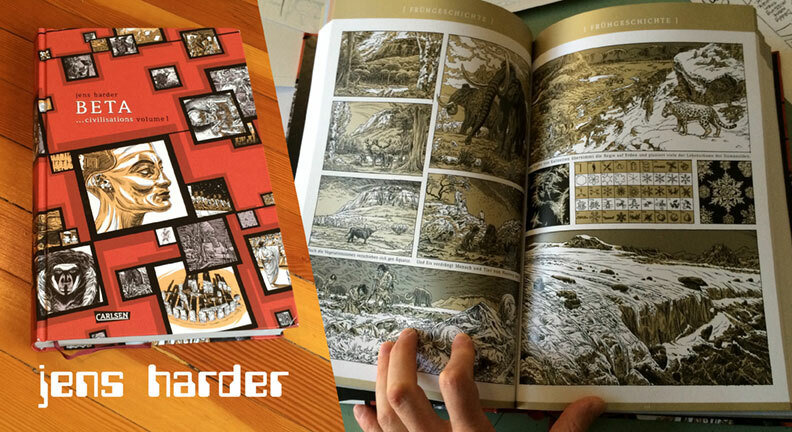 Finally, this just arrived in the post – BETA (…civilizations volume 1) by German cartoonist Jens Harder. 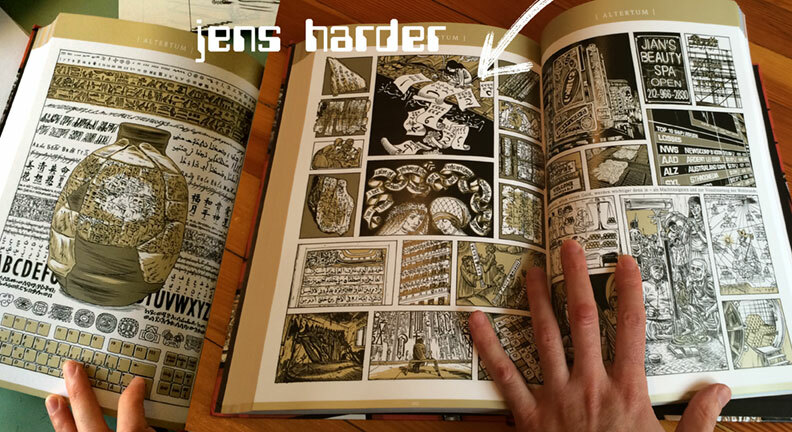 In this intricate, mind-boggling, coolest possible coffee table book, Jens catalogues the history of human evolution & civilization. Every image in the 365 page tome (apparently the first in a trilogy) is sampled from existing media – cave paintings, etchings, pottery, photographs, film, comics, etc. then redrawn in Jens’ meticulous brush lines. For those of you who thought HABIBI was nuts, this takes it to the next level. Speaking of which, here’s a page that references HABIBI in the development of written language. A favorite page of mine groups CHRIS WARE alongside Caravaggio, Courbet, and Magritte to name a few. After getting home from three weeks in LA, I have a couple events unfolding in the Portland area. 1) The local launch for First Second’s FAIRY TALE COMICS with cartoonist (and Laika storyboarder) Graham Annable at GREEN BEAN BOOKS. 1 PM on Saturday, September 28th (1600 NE Alberta Street, Portland). 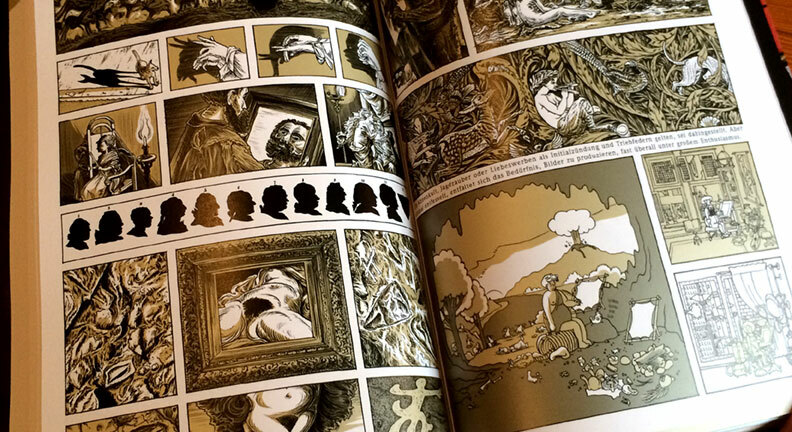 More on that anthology – a sequel of sorts to NURSERY RHYME COMICS – here. 2) A two-way stage conversation between Gene Yang and I to scour the crossover themes of our coming-of-age memoirs (AMERICAN BORN CHINESE) and historical, religious epics (BOXERS & SAINTS) at the WORDSTOCK literary festival. 3 pm, October 5th, Oregon Convention Center. Hope to see you locals there! My upcoming all-ages book has been officially announced. 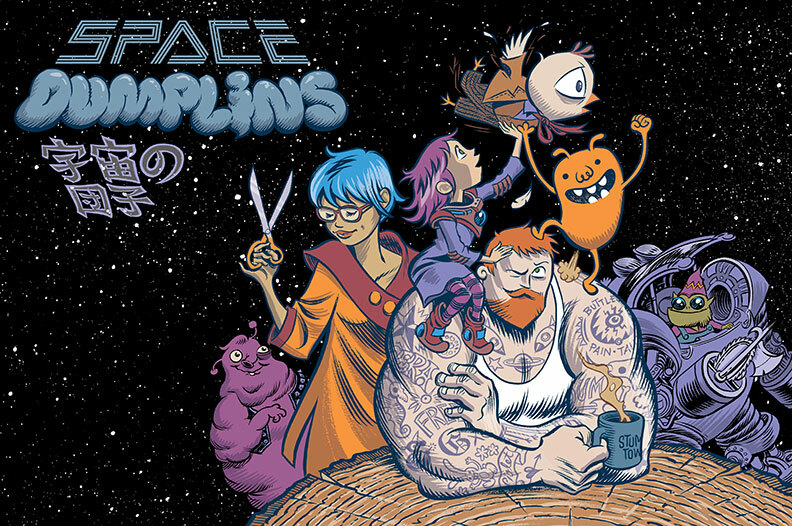 It’s titled SPACE DUMPLINS and will be published by Scholastic. I want it to work like a Pixar film — fun & appealing to the youngsters, while simultaneously fulfilling to you, my faithful readers. The bad news is that I haven’t drawn any new pages since the last blog-posting, because of a hand injury. Prohibited from drawing, I’ve been obsessively combing over the thumbnail draft, thus further applying the Pixar model of endless rewrites. My New Year’s plan is to take off the splint and leap back on the drawing wagon. And the book will keep me busy through all of 2013. Aiming for a 2014 release. Finally, if you’re looking for last-last-minute holiday gifts, there’s still a limited amount of oversized HABIBI screenprints available at CRACK PRESS. Season’s greetings, Blog-friends! Thanks for checking in throughout the year (despite my infrequent posts). And thanks for making it to any of the HABIBI tour events! My trip to Jordan turned out to be was the most fulfilling possible conclusion to HABIBI book tour. It was hosted by the US Embassy in Amman; worth noting as a reminder that our government cares about the arts (and graphic novels!) and sees them as a vehicle for cultural exchange. This turned out, however, to be a difficult & chaotic time for US Embassies in the Middle East, beginning with the attacks in Libya. It was an unsettling surprise, two days after my arrival, to learn that HABIBI was on the banned books list. And it was surreal to be ferried around in an armored vehicle, past security checkpoints, to roomfuls of adorable children brimming with creative energy, while elsewhere in the region, violence was breaking out over an internet video. 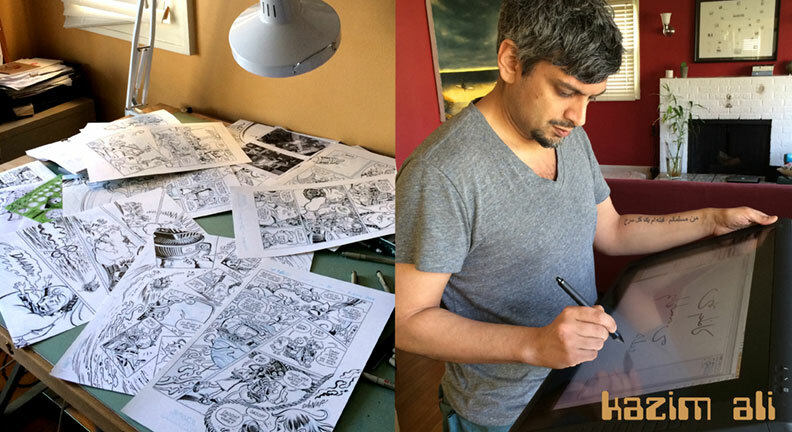 During a two week stay, I conducted graphic novel workshops to three entirely different groups, each with their own inspiring dynamics. The first were deaf children (ages 5 – 20) at The Holy Land Institute for the Deaf in Salt, Jordan. These kids were a bit baffled by the concept of comics (perhaps even drawing) on the first day of classes, but by the third day, they were churning out comics with wild abandon. The institute is a boarding school, and the theme of missing one’s family was a common one in many of their stories, but the concurrent theme was that of gratitude towards finding an extended family they could actually communicate with. Through comics, these kids proved quite eloquent with word balloons, sound effects and visual music. My favorite exercise was a pairing up of students – boy/girl, young/old – in which one student signed a story and the other translated it into comics form on a board in front of the class. The second batch of workshops was with inner city youth – teens and university students – at the Princess Basma Youth Resource Center Computer Clubhouse. They channeled passions for music, graffiti, writing, architecture, and even computers into comics pages, collaborating on an anthology conceived and drawn in only three days — a pretty impressive display of constructive teamwork. If only I’d been so focused at that age! The girls (above left) are refugees from Syria and amazingly prolific cartoonists. They talked of creating a graphic novel to document their experience fleeing their war-torn homeland. The world needs this book to exist! In the final workshops (below) held at Mlabbas – a hipster t-shirt shop on Rainbow Street in Amman – we gathered professional artists with specific interest in graphic novels. It was refreshing to be around like-minded, similar-aged peers without a language barrier, and also to witness the outset of a burgeoning comics scene. Every single meal we shared was an AMAZING FEAST! The media paints a bleak outlook for the region, but there is a visceral optimism around the arts and self-expression and the medium of comics. Finally, despite the banning, we were able to organize a bookstore signing where I met HABIBI fans from Jordan, Palestine, Syria, and Iraq. These two fans (below right) had only recently left their homes in Iraq. Readers found the book’s ban quite arbitrary, and felt it corresponded with a time of public frustration towards increasing government censorship in Jordan. Many Muslim readers thanked me specifically for the reverent depiction of their faith in HABIBI. At the Holy Land Institute in Salt, there were children who were not only deaf, but blind. They and their teachers labored so intently, against all odds, towards dialogue and understanding. Humans need communication. Art is a privilege, a great responsibility, and a necessity. Thank you to the US Embassy and to their program that has represented music, theater, and dance for specifically requesting a graphic novelist this time around. And thank you to all my amazing new friends in Jordan for their generosity and inspiration. Keep making comics! In other news, thank you, Blog-readers for the birthday wishes. And thank you to those I met at the National Book Festival in Washington DC, the official end-cap to touring. Special congratulations to Mike who proposed and Becky who accepted while waiting in line for the signing. The engagement ring was embedded in a carved out copy of BLANKETS! It’s been a full year of touring with HABIBI, and this week takes me to what feels like a pinnacle – the Hashemite Kingdom of Jordan. While there, I’ll be conducting comics workshops with deaf children at the Holy Land Institute in Salt city, youth at the Princess Basma Youth Resource Center in Amman, and an elite group of Jordanian graphic novelists. This promises to be a life-changing experience; and I’ll be sure to bring home drawings/stories for the blog. A couple of days after my return, I’ll be at the National Book Festival hosted by the Library of Congress in Washington DC. My presentation & signing is from noon – 2:30 on Sunday, September 23rd. Enticing invites keep pouring in from all over the world; but I’m feeling growing pressure and obligation to get home to the drawing board and start producing new comics pages! My plan is to travel nowhere for October – my first month of not flying since this time last year. Thanks for the reminder, Jordi! The all-ages book is progressing, but still in its secret stages. What I can reveal is that I got last minute tickets to attend San Diego Comic-con this week. At 10:30 am on Friday, July 13th, I’ll be signing at the Top Shelf booth (#1721). That night, I’ll certainly be attending the Eisner Awards. And on Saturday the 14th, from 10am – noon, I’ll be presenting a writers’ workshop on ‘World-Building’ at TR!CKSTER (795 J Street, San Diego, CA). My plan is to hang around TR!CKSTER quite a bit, where they’ll be selling a super-limited-edition HABIBI screenprint – handpulled by Portland printmaking superstar Pete McCracken. 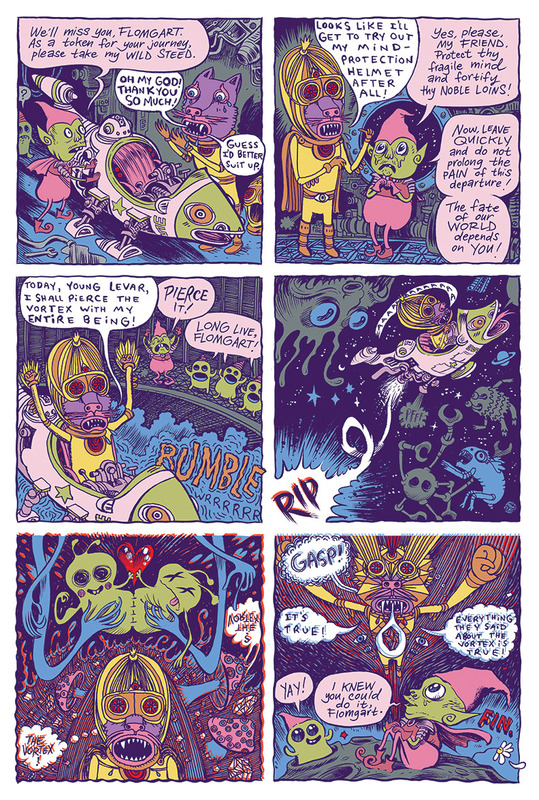 Speaking of Portland superstars, cartoonist buddy & psychedelic visionary Theo Ellsworth (above) is leaving town; so we got together for one last drawing day, and crafted an afternoon jam comic (below). FLOMGART’S DEPARTURE is inspired by Chicago’s Trubble Club sessions. For other surreal, half-baked jams on this blog, revisit those with Aaron Renier, Fabio Moon, and my brother Phil. Thank you all for your patience while dootdootgarden was down. It was eaten to death by spam like a disease. Now it’s up-n-running on a more reliable server, and with a more professional name – craigthompsonbooks.com. Thank you, too, to those who brought the Twitter impostor to my attention. Finally dealt with that creepy pest. Work on new projects is shifting into a bit of a secretive stage; so in the meantime, here’s some treats from the HABIBI process vaults and my sketchbook. 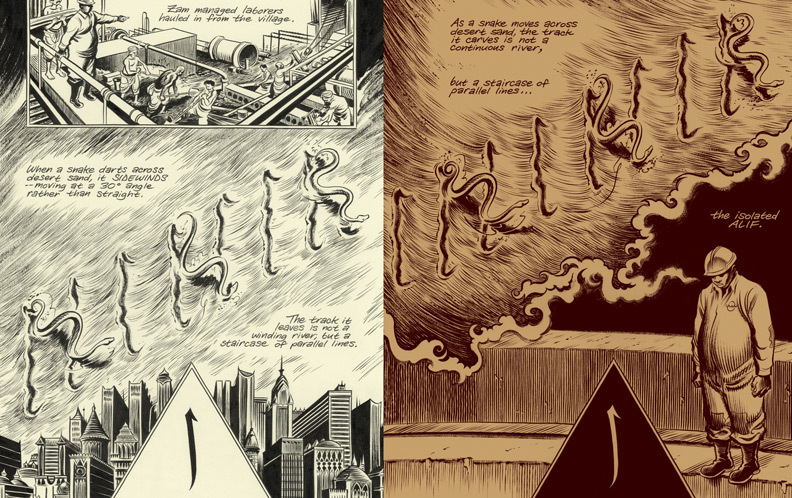 Above left: a discarded page of HABIBI that was reworked into page 591 of the final book (right). Note that the sidewinding snake looks almost exactly the same, but is redrawn. And the narration becomes less clunky. Below: an exercise in my sketchbooks is to copy a frame from a favorite film to get a sense of the composition and chiaroscuro balance of light and dark. 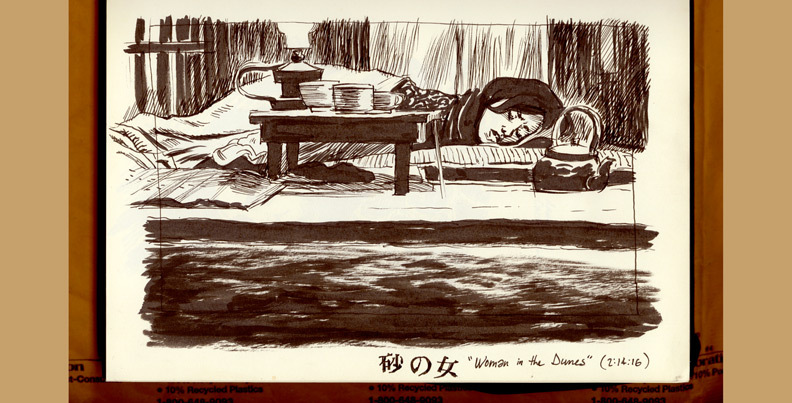 This one is from Hiroshi Teshigahara’s The Woman in the Dunes. My next event is the Festival of Faith & Writing at Calvin College in Grand Rapids, Michigan — April 19th thru 21st. More on that soon. wave graphic. Here’s a shot of the award, and the man who presented it — noteworthy fantasy author & gentleman Terry Brooks. And Aussie buddie Pat Grant released a new book named BLUE that I’m quite fond of. of deliciously polite folks. As for Angoulême, Drawn & Quarterly and Sarah Glidden do a great job of summarizing the festival. Here’s myself with two of my favorite French cartoonists – Dupuy & Berberian!